We are pleased to highlight the new game features in our most recent version of Blazing Silks! 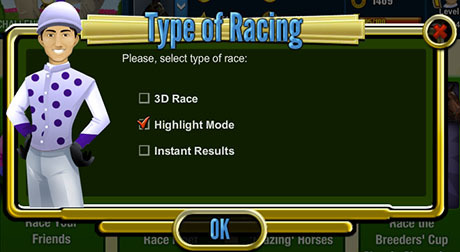 In addition to instant results and full 3-D races we had added “highlight mode” as a new racing feature. In highlight mode, your race is presented in a few short segments of racing providing a visual summary of the key action. any time you race, you will be given the opportunity to see your race and any of these three modes. We have also added night racing on several tracks: Santa Anita, Abu Dhabi, and Kensington. At the bottom of the race viewer you will find a new race “tracker” that shows the relative positions of the horses to each other and their progress through the race. One of the most exciting addition to our game is real time multiplayer peer-to-peer racing. 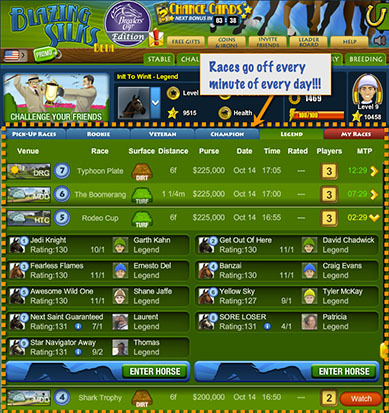 Now you can race up to 14 players real time for substantial prizes. Ther are races going off every minute and prize purses of up to $1M coins. 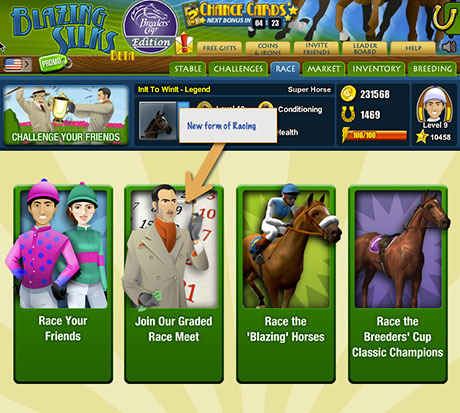 To participate in these races go to “Race”, then choose the newly added icon “Join our Graded Race Meet.” On the next page you will see several categories of races – “Pick Up Races” go off every minute and are broken into horse rating category – find the right race for your horse and join in. We also have “graded” races that are open to your horses by their “rank” and go off every five minutes. On the right side of the page you will see a red tab labeled “My Races” this is where you can keep track of races you have entered. when you choose a race to eneter you will first see the other participants, click “Enter Horse” and a popup will appear showing entry fre and potentialwinnings. You can change your tactics or just enter the race. One additional form of racing that has been added is Friend-to-Friend Stakes Racing. 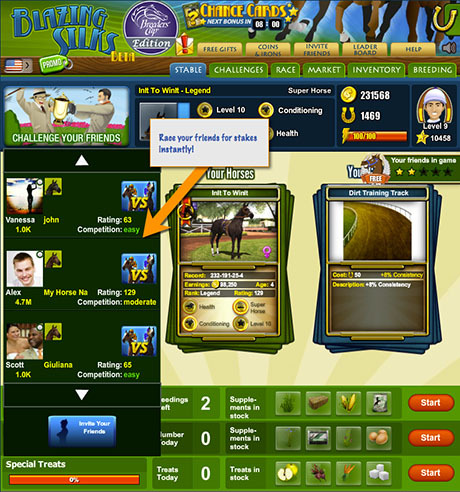 By clicking “Challenge Your Friends” in the header bar, you will see a drop down list of your friends and their horses to race against. 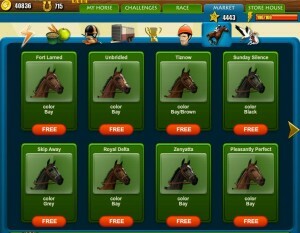 You can choose which horse to race againt by select their icon, then click the blue “VS” button to setup your challenge. 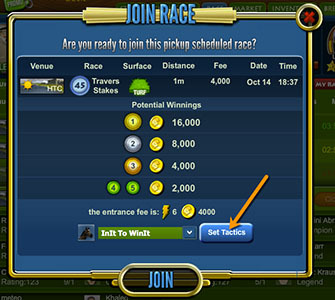 Set your stake, choose the track, distance, conditions and Night/Day, setup your horse, then send you invite to your friend. If they are in the game, a popup will appear indicating they have been challenged, if they are on Facebook – but not in the game – they will get a facebook message; if they are not in facebook, they will receive an email. Your friend can either accept your challenge or send you a counter offer in terms of the stakes amount. Look in the upper right hand corner of the game to see your messages. We have re-designed the header bar to give faster access to information and more gameplay options. 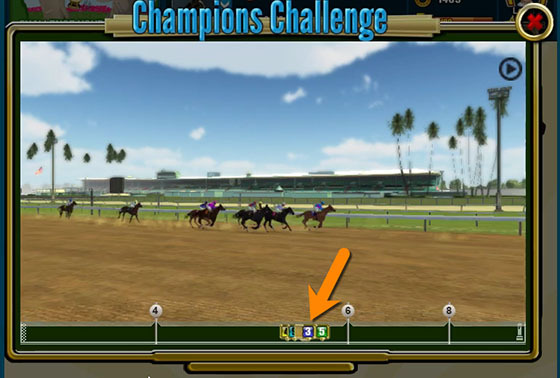 We have re-designed the “Challenges” header bar to accomodate the addition of more tracks and to break them into core story line tracks “Breeders’ Cup” and bonus tracks “Gold Cup.” Just click on the slider icon to choose your track group, and then click the blue drop-down arrow to see tracks. 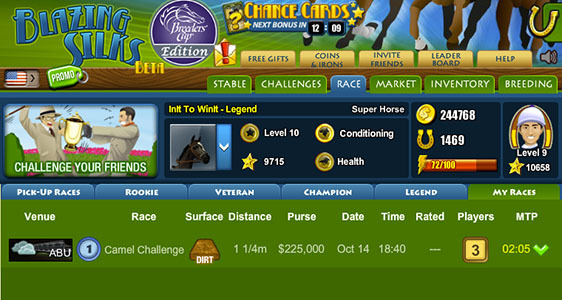 Your progress in completing the challenges is indicated by the percentage listed next to the track name. 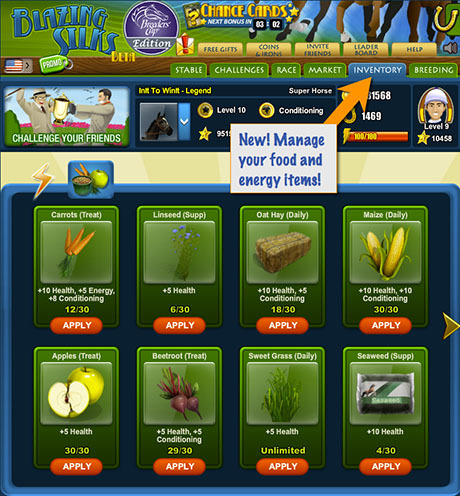 We have added the concept of inventory, so when you buy items for your horse (food or energy) you can stock up on the items you want in the market, store them in your inventory and then just apply them to your horses when they need energy or as part of your daily feedings or treats. 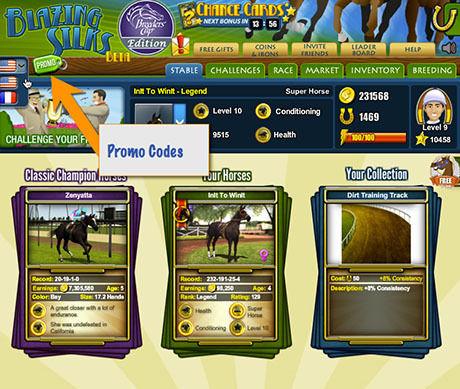 Often times we will offer promotional offers by email or on our Facebook Page and you can enter those codes by pressing the green “Promo” tag in the upper left hand corner. 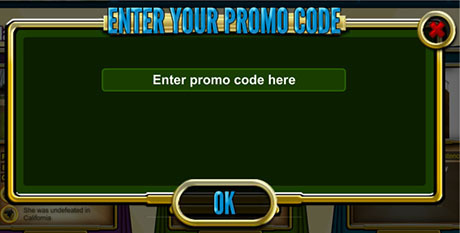 When the popup window appears, enter your code and collect your prize. Finally, we have been localizing the game in the languages of some of our larger international player groups. We have started with French. Click the flag in the upper left hand corner of the game and you can change the base language of the game! We are pleased to highlight the new game features in the latest release of Blazing Silks! Now you have the opportunity to have up to 8 horses in your stable. You can either earn horses in special challenges or buy them from the market. Each one of your horses is unique, and you can train them to be either an all-rounder, a distance runner, or a proficient sprinter. 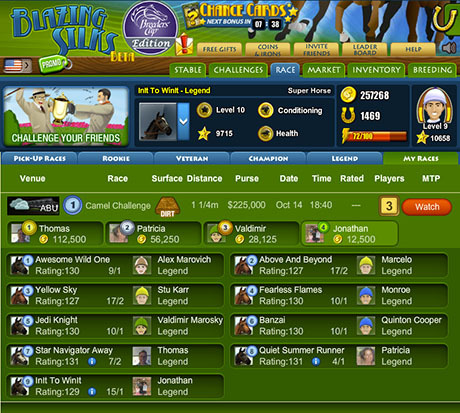 There are separate “horse levels” that you can complete to increase their ranking and rating and fulfill the game objectives. 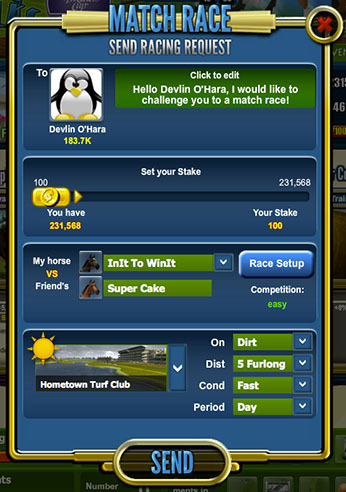 Don’t forget that you can race any of your horses against your friends in match racing! Once you have won the Breeder’s Cup at the Santa Anita track, you can make a free prediction on a classic champion in a special challenge race. 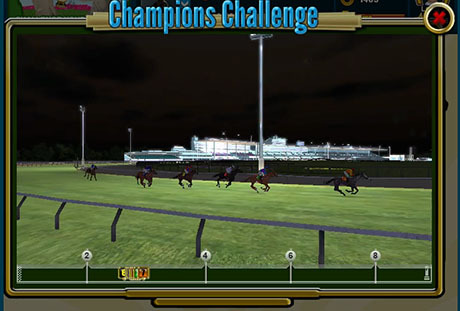 If your chosen horse wins, you can add the horse to your stable for free!If your chosen champion loses the race, you will get a consolation prize. You can also unlock champion horses by inviting friends to the game. If you invite 5 friends to the game then you can choose a champion horse. 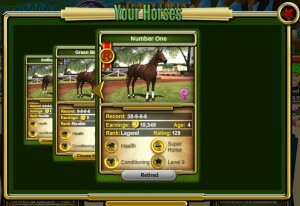 Thereafter every time you add 10 friends you can choose another champion horse card for free! A “Horse Training Pathway” is a training regimen designed to specialize your horse for different kinds of racing. 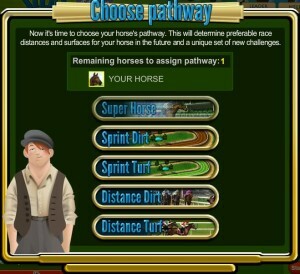 By choosing a pathway, a unique set of game challenges will determine preferable race distances and surfaces for your horse in the future. Every time you add a new horse to your stable you have the opportunity to choose a “pathway”. New horses can be added to your stable by breeding, earning them in special challenges, buying them from the market, or earning them when you invite friends! So you can build a stable of sprinters, distance runners, or a mixture of abilities and earn your place on the leaderboards! Super Horses have the same performance on any track conditions, improve at your discretion and train the best champion ever! Quick acceleration on dirt tracks allows you to run these horses pretty fast and hit the finish line at the max speed! These horses have strong stamina to keep running long distances at high speed even on dirt surfaces! 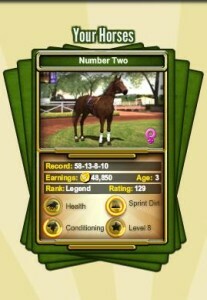 These horses have strong stamina to keep running long distances at high speed especially on turf tracks! With the advent of multi-horse support the game now distinguishes between horse and player level. Each horse starts at level 1 and progresses through a series of challenges and races gaining experience points as it goes. A level distinguishes how many experience points your horse has earned. The player level is your character’s level, as you play you earn coins and progress up the leader board, as you increase in levels you can gain more special items and the opportunity to unlock new tracks and challenges. 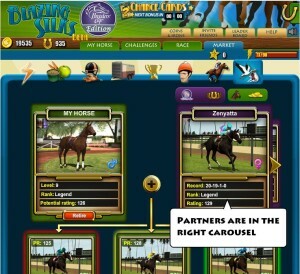 At the beginning of the game, your horse comes to you as a young and untrained 2-year old horse. 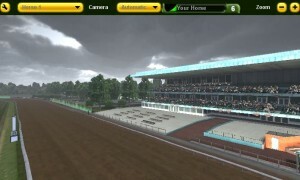 As you progress in the game, your horse will be trained and its racing abilities in the track will be enhanced. Your horse will travel all around the world to become a great champion, but this will take time and effort that will, eventually, degrade his performance. You can keep your horse in good condition by meeting its daily food and sometimes medical needs. 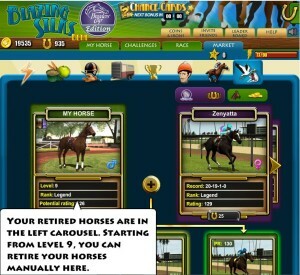 But once your horse reaches level 9, it will turn 4 years old and it will be past its prime. 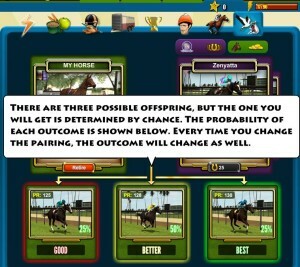 Then you will have the chance to retire your horse and use it to breed a new champion. 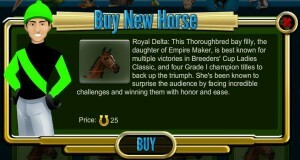 Once your horse is retired, you can use it to breed new champion horses. 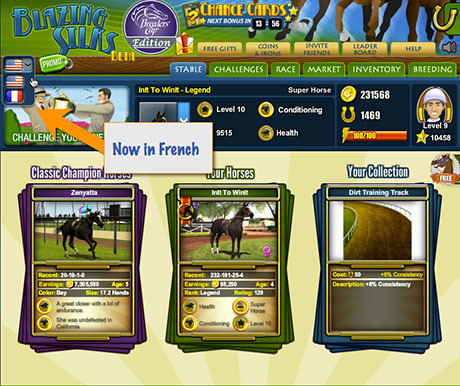 By breeding your own horses you are able to breed your own line of champions by careful selection from your own stable and famous champion horses. The Store House has been introduced as a convenient place to store all your goodies. When you buy some food for your horse, or you get a food or an energy “gift” from any of your friends, those items are stored in the Store House. Here you will find your items,how many of them you have availableand the maximum amount of each item that you can have. There are two new Classic Champion horses that were added to the game. Their names are Royal Delta and Fort Larned. 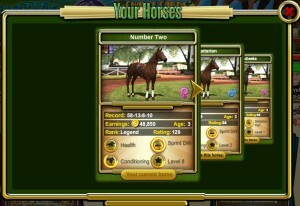 Those horses are available in the Market and can be purchased for 25 Irons(in-game currency). Challenges have been upgraded. Race challenges show the conditions and distance, and now record your best result, and allow you to repeat the challenge to see if you have improved! 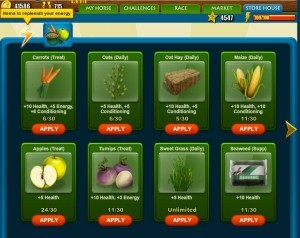 The payout and requirements for the challenge are now more easily seen. You can select your horse from your stable directly at the top of the challenges screen and instantly see their progress and selected training pathway. The game now allows you to receive free gifts from your friends and send them gifts in return. You can exchange helpful items such as health, energy, and conditioning enhancements which are stored in the Store House for you to use. 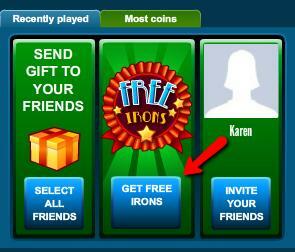 You can send a gift by clicking on the “FREE GIFT” tab in the upper left corner, next to the “Coins & Irons” tab. one friend at the time under their name. When a friend sends you a gift you will receive an in game message through our new in-game mail. You can access your messages by clicking on the in-game mail icon. Sending free gifts is easy, you can select from a variety of available gifts to send your friends, and select one or all of your friends! We are now pleased to offer free in-game currency in collaboration with our partners. As well as getting a great deal on selected products and services we will give you free irons to spend how you wish as a reward. 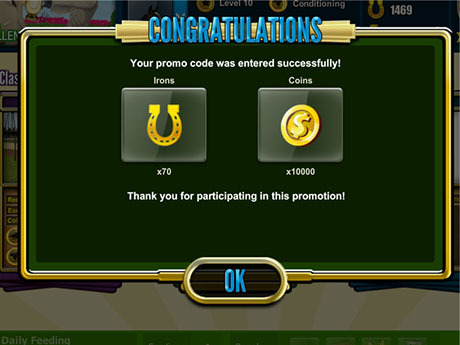 To access the promotions just click on the “Free Irons icon at the bottom of the screen, or any of the bonus offers on the far right of the screen. You have now the opportunity to interact easily with your friends by sending gifts to them or racing against them into a “friendly race”: in these races you will be charged coins and a little energy, but if you win you will double your stakes and earn some experience points. There is no cost to the friend you are racing against. 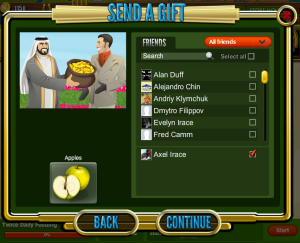 You can also invite new friends to the game so you have some more fun with new opponents, using the new Friends Panel, which is located at the bottom of the game interface. It’s easy to invite new friends, and if you invite enough you will get to choose another horse for your stable! 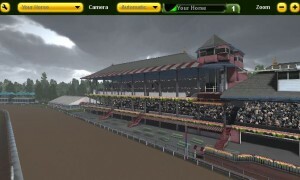 There are a two great tracks being opened in this game release: Saratoga Race Track and Belmont Park. Both have incredible amazing landscapes and challenging track surfaces where the most famous horses in history have placed their hoofs. Both can be unlocked in the market for 25 Irons.